what is the longest anyone has done tech dh? like supertiresome ultra fast dh. is there any run that is over 1/2 hour? could u pm me w/ directions? and could i do it on a ht? or do i have to wait 'till october? My dh course is only 3 mins..... 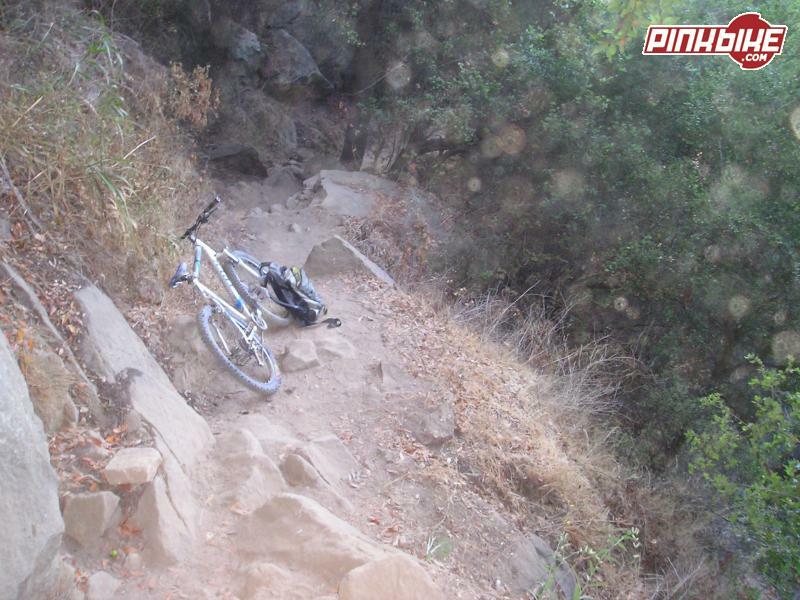 But you are in very rough shape when its done, its super steep, and BUMPY. going like 20+ mph over helmet sized rocks every 1 foot. crazy stuff indeed, I love it. I have seen pics of a 30 minutes race course in Africa...30 minutes race pace would be crazy. i ride them on my chameleon so it can obviously be done, but i have been riding these trails for over 2 years and i still have quite a bit of trouble on a hardtail. How good of a rider of you? "who vants a mustache ride?" The mega avalanche race in Peru is the longest I've heard of. can someone post pics of tunnel's terrain? or people hittin' it? Mt. Wilson is 17 miles down. Can't go too fast though, lots of hikers on weekends. hey T, is that the first double or is it the one by the hip? There is a DH trail called Alamo Peak from Cloudcroft NM (9,500 ft) to Alamogordo, NM (4,000 ft) that is approx 16 miles, and it takes over 3 hours to do. All DH except for 1 short fireroad section that connects 2 trails, no more than 1 mile...very slight uphill, and rideable on a DH bike with 1 chainring...good time to catch your breath. Greta ride, last time I did it was on a hardtail, looking forward to hitting on my DH rig in a few weeks! I actually liked riding tunnel on a hardtail. The more feed back you recieved from the trail caused you to pick better lines and become more fluid, now I just plow through stuff. People say its pretty 'core,' but me and my bro's used to shred it 2-3 times a weekend on $350 specialized POS hardtails with no pads and skate lids. If it doesn't rain this weekend I'll try to get you some pics. I usually find it hard to break out my camera on that trail though. I've got some Tunnel photos. 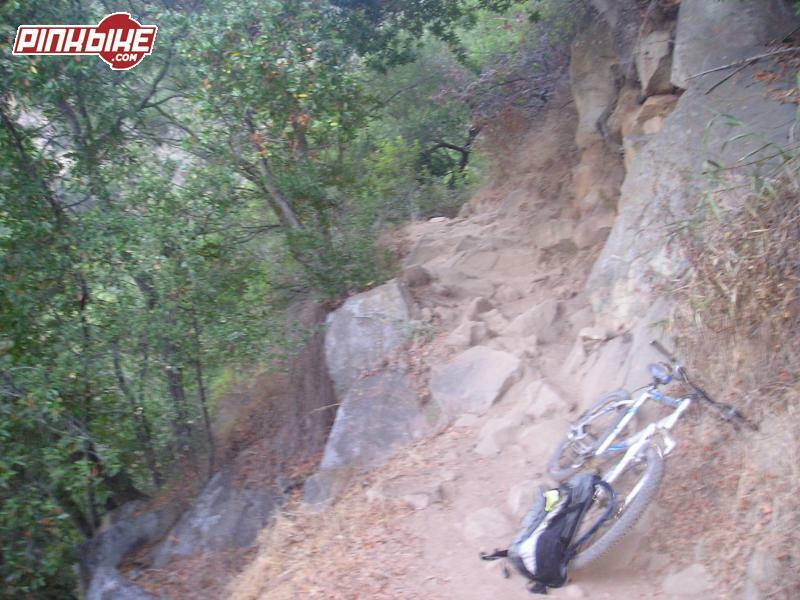 Rode Tunnel, Cold Spring, and San Ysidro all the time on a hardtail (Trek XC frames). I have only taken my Scream down Tunnel once and Cold Springs twice since I got it at the end of summer. 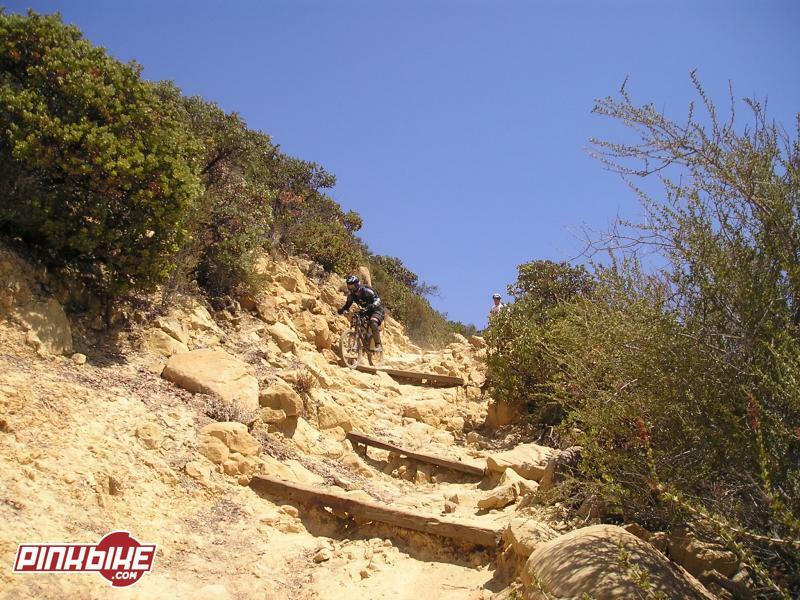 If you are a decently smooth rider a hardtail should be fine for these trails, however most people are not smooth and think that a long-travel F/S bike is necessary for Santa Barbara trails. Here are some Tunnel shots, mainly of the notorious stair section. Kill the brakes and let er ride..
what's up w/ the wood? Here are some Cold Springs and San Ysidro pictures. The CS pics are from upper cold springs, in my opinion Cold Springs is just a little lower on the GnarGnar meter. 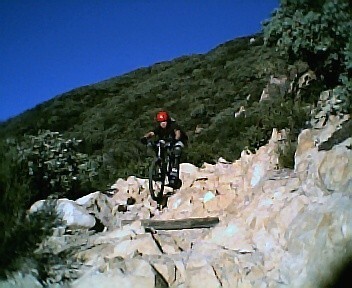 A little fewer rocks, but just as tech as Tunnel is, CS is my favorite trail I have ridden in SB. San Ysidro pictures are of the stair section on the lower half of the trail. This is one the gnarliest parts of SY, the rest of the trail is much smoother and faster. I blast to ride on a HT. and yes those were my old bike/s 21" Trek 930 and a 22" Trek 4300, they are now replaced with Banshees. Those pics don't really do the rocks a lot of justice. A lot of the sections you are just going down tons of small rocks and praying you stay on the bike/trail. Also, I have ridden Tunnel on a bmx bike with dirt tires and gyro front and rear brakes...yeah that wasn't fun. but a bmx bb is soo low... how'd you clear the wood? I did 2003 & 2004 the Bike Attack in the Swiss. The course is 30 Kilometers long. The first 11 Kilometers are very technical then you have 3 KM's of fireroad and then trails for the rest of the race ! Unfortunately it won't happen in 2005. But the Upper section is open for most of the year ! The complete Race was run by the winner in a time of 58 Minutes. 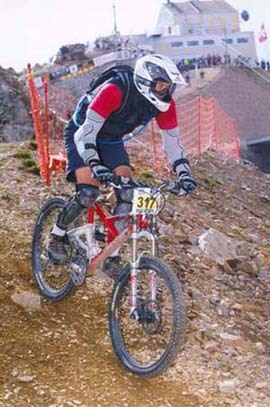 The other race is the Megavalanche in France Alpe D' Huez. It's about 25 Kilometers long and starts at 3.360 Meter above sea level ! Its also very technical and very demanding. Looks like worth a road trip for SF Bay Area but are the hikers down there just as bad as the ones up here? Downieville is a really long race. You drop 4,700ft in about 15 miles. Fun as hell! Depending on your definition of downhill, Porc Rim, when connected with a couple of trails above it, is something like 25 miles and probably drops about 4000 feet. Not sure if this meets your def. of "downhill" though. that is the one i was gonna say. Yes there are bad hikers around. And many are buttheads. If you leave the top of Tunnel by like 7 am you can get two runs in before 9 and miss most of them. 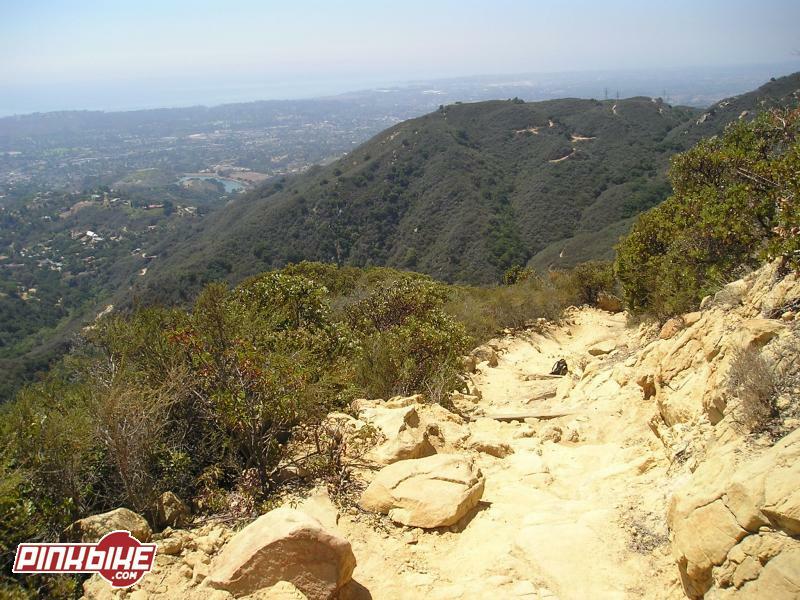 The trail drops about 3800 ft in 4.5 miles. Take Temulpa make the rocks bigger and the trail much longer and you have and idea. It is worth the drive. the mountain i'm trying to save takes intermediates 40 minutes to get down. in the la sals in moab utah i did a 40 mile downhill losing 10,000 feet in elevation. 2500' of climbing and 10000' drop 7 hours or so. 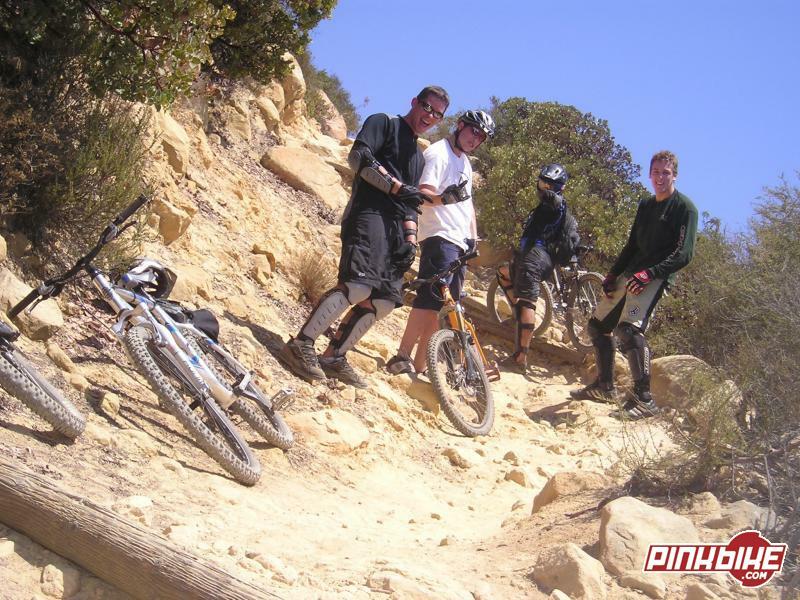 also porcupine rim takes a coulpe of hours to ride down. the one in the la sals actually starts waaay above porc. rim and finishes using the porc. rim. Last edited by downhill mike; 03-29-2005 at 05:07 PM. So you finish 2000' underground? http://cf.geocities.com/serge_lamarche/session_7.html here is some info on shuttle runs....... for the race though the chopper your bikes to the top above the glider launch. u ride the shuttle as far as u can and hike the rest. its soooo worth it. yep you finish way underground.i think cumulative was the word i was looking for. You're talking about Porcupine Rim in Moab right? Never rode the offshoots, but with a four mile (or 3.8 or something) climb from the trailhead you get a solid 10 miles of downhill afterward. I tryed to do it when I was there last week, but there was 6 inches of snow. So I rode Amassa Back, which was all right, but had been bulldozed in sections over the last year, making it a lot less technical. Long downhills rawk.